Update: This contest has ended and the winner has been chosen by Random.org. Congratulations, Florence! 🙂 I will contact you via email. Do you know what today is? Well, yes. It is Tuesday. 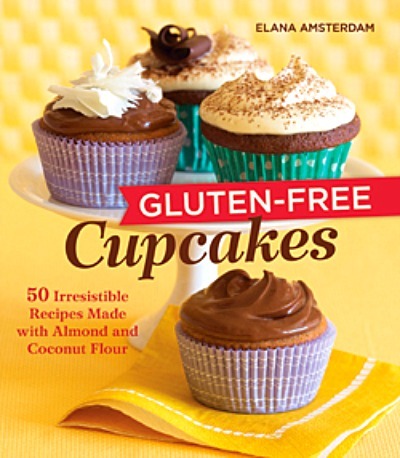 But…today is also the day that Elana Amsterdam’s new cookbook, Gluten-Free Cupcakes: 50 Irresistible Recipes Made with Almond and Coconut Flour, is finally available. I know that today, many of you who pre-ordered your copies from Amazon for the unbelievable price wavering in the $9.00 range, will most likely have a copy arriving on your doorsteps. But for the rest of you? You better go order your copy now. The price will not be this low for long. What are you waiting for? I will not lie. I have had my copy for a couple of weeks now. And I have put it to good use. The pages are sticky with batter already from the five different recipes I have made from it so far. And I have already had to pry it out of one of my girlfriend’s hands before she left my house with it. Literally. At least I know what I will be getting her for her birthday next month. That just made gift shopping really easy. I have had so much fun working with the different recipes in the book. These recipes are so simple to assemble. Not many of them even have more than seven or eight ingredients, and that includes counting the pinch of sea salt that is called for in each recipe. So far I have made the Strawberry Cupcakes three times. The last time was on Easter, where they were devoured by the kids and adults alike. I never even got one. They were gone before I had room for dessert. I made the Chocolate Chip Mini Cupcakes just for fun. I stashed some of those in the freezer for a nice little treat for my son’s lunchbox. Not surprisingly, however, I have found my supply quickly dwindling. I have also found my husband with melted chocolate around his mouth more than once. Call me Sherlock Holmes if you want, but I think I have discovered my cupcake thief. I have also made the Blueberry Lemon Cupcakes for a brunch I attended last week. I had 4 different women ask me for the recipe. Then, the other night, I decided to go for one of the savory recipes that Elana also includes in the book. Because I am a Goat Cheese lover, I went for the Scallion Goat Cheese Muffins. Oh my goodness. Now we are talking. They were unbelievable. I served them for “Brinner” (that is breakfast for dinner, just in case you hadn’t deduced that yet). I made a Spinach and Scallion Quiche and served these alongside. I ate three with my meal, and could have easily eaten three more. And finally, I recently whipped up these Lime Cupcakes. If you are looking for a perfect spring-time cupcake, you seriously need to look no further. This one is it. The flavors of the coconut and lime come together brilliantly here. And now as a treat for all of you…I have permission to share the recipe with you today. After trying this one, I think you may be convinced that you need this cookbook. I will even give one of you a chance to win a copy of it (details below). And finally… Good Luck! This contest ends on Tuesday, May 3rd at 3pm PST. Make sure to check back and see if you are the lucky winner! I am following Elana’s Pantry on Facebook. LOVE LOVE LOVE chocolate cupcakes, maybe a little peanut butter thrown in the mix! I have to admit I’m hard pressed to pass by any fudgy all chocolate cupcake! But the recipes you’ve shared certainly look like they, too, are not to be passed up! I’m new to your blog, but have to say I’m really enjoying it very much. Great job! Keep up the good work. Now my son can enjoy all the birthday fun with these cupcakes. Cant wait to get my copy! I would have to say my favorite cupcakes are lemon with raspberry frosting… I would love to see if there is a similar recipe for these in your book. I miss them! Wow, you’ve been a busy baker! The husband and I are eating the Marble Cupcakes from this cookbook with fresh strawberries on top right now. They are delicious! I think I was light on the coconut flour (should have weighed it) as they are very souffle like, but tasty nonetheless! German chocolate is my favorite cupcake – mostly because I love love love the nutty and coconutty icing (I absolutely loath buttercream style frosting). I love any kind of cupcake. Some days it’s chocolate, other days, fruit. Those lime cupcakes look really, really good. But so does the strawberry. I am so indecisive. I follow Elana’s Pantry on FB. I am following Elana’s Pantry on FB. I really want to try to goat cheese raspberry cheesecake cupcakes. I follow Elana’s Pantry on Facebook! And I would love to win this cookbook as I have just started using almond and coconut flour and would love new recipes to try! I LOVE cupcakes!!! I will have to try the strawberry. I am now following Elana’s Pantry on FB. I am following Elana on FB. I am following Cook IT Allergy Free on FB. I have a whole bunch of organic limes at the ready and hope to make these Coconut Lime cupcakes soon! I love anything with chocolate and toffee!!! Cream-filled chocolate cupcakes topped with thick frosting are my all-time favorites! I luv to make cupcakes that put a smile on my celiac daughter-in-law’s face ~ any tastey gluten free cupcake is great! Thanks for drawing my attention to Elana’s Pantry on Facebook! Thanks for drawing my attention to Cook It Allergy Free on Facebook. Appreciate it! Chocolate has always been my favorite, but cannot have chocolate anymore thank you very much migraines!!! But these lime cupcakes just might become my new favorites, they sound scrumptious! I follow Elana on Facebook!! I follow Cook It Allergy Free on FB! 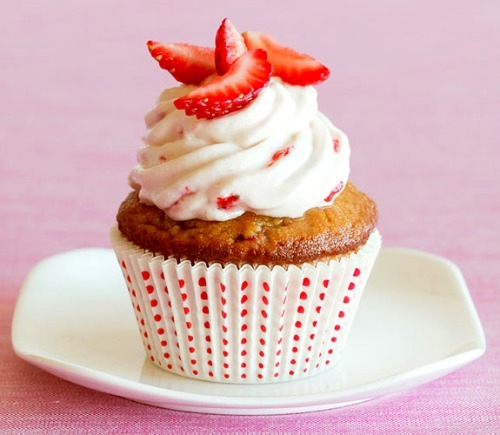 I love strawberry cupcakes with a strawberry cream cheese icing. I am already following both of your wonderful sites and also on Facebook! I follow Elana’s Pantry on FB! I love Red Velvet cupcakes! Yummy! Just like my Mom used to make! I now followi Elana’s Pantry on Facebook. Hey Rhiannon! Not all of the recipes call for almond flour. In fact many of them only have coconut flour in them. The two together just add a nice texture. But you can totally only use coconut flour. Coconut flour alone though, does require more eggs in a recipe. But this would be a great book for you and S.
yay! yea i see a lot of recipes calling for almond or a mixture with almond flour, so it’s great to know that i don’t have to. i love coconut flour! My favorite flavors are ginger spice and blueberry (though not necessarily together). I’m now following you (Cook It Allergy Free) on Facebook. I love carrot cake with cream cheese icing, but both the strawberry cupcake and coconut lime cupcake you have pictured sound amazing. I really must learn how to make food prettier and am glad I can see ideas here. I’ve already ordered my copy from Amazon and can hardly wait, thanks for the preview! My favorite cupcake flavors generally include chocolate and/or cream filling. Since I am trying to greatly reduce my dairy intake and I have to eat gluten free, this would be a wonderful addition to my cookbook arsenal! I have Elana’s first cookbook and I love the ease of her recipes. These all look so good but I have to say that I am a great fan of the chocolate cupcake. I have subscribed to CookItAllergyfree email and also use the iphone app. Followed both on Facebook! My favorite is marble because that’s what my mom used to make as my birthday cake! I love any cupcake with Lemon or lime in it! The one featured looks great. I follow Cook IT Allergy Free on FB too! My favorite cupcake flavor is plain old chocolate. I love them all but will never apass up chocolate. yum! I have Elana’s first cookbook and LOVE her pie crusts. My favourite cupcake though would have to be a light fluffly chocolate cupcake with sweet cloudlike vanilla frosting…. nom nom nom…. I just liked elana’s pantry on facebook. I’d love this cookbook now that I am going gluten free. If I donn’t win it will go on my wish list as I have heard so many good things about Elana’s recipes. My favorite cupcakes would be either chocolate or carrot cake. Love them both! By far strawberry is my favorite! I am usually a chocolate cupcake kind of girl, but those blueberry lemon ones sound amazing! My mother in law LOVES blueberries….those might end up on our mother’s day brunch! My favorite cupcake flavor is chocolate with cream filling and/or coconut creme frosting!! So yummy! I just like your page on Facebook as well! Excited to try your lime cupcake recipe! I love all cupcakes! But my favorite is anything with pumpkin. I also can’t wait to try the vegan coconut frosting. Thank you! My favorites are carrot cake cupcakes with cream cheese frosting….but those lime cupcakes sure sound good. I will have to try them and they just might become my new favorites. The cupcakes look amazing! I love chocolate chip cupcakes with chocolate icing! I like your site on Facebook too. Thanks! My favorite cupcake has to be vanilla with a hidden oreo in the bottom! It’s definitely gotten tricky to recreate that since going gf & df! Following Elana’s Pantry on FB. I love chocolate cupcakes. However, I’ve always wanted to try a lime flavored cupcake! Nothing beats a chocolate cupcake and I can’t wait to try out the chocolate chip mini cupcake recipe! My favorite cupcakes are Lemon – I will be trying the Lime cupcakes – they look so pretty and I’m sure are very tastey! I follow you both on facebook and twitter! Would love carrot cake cupcakes like Elanas carrot cake recipe in her first cookbook! I love all flavors, but cannot resist chocolate! My favorite cupcake flavor, hmm (wow this is a hard decision), has to be chocolate with peanut butter frosting. I “liked/followed” Elana’s Pantry on Facebook. I already “like/follow” Cook It Allergy Free on Facebook. Vanilla! Plain – no frosting. And I just followed Elana on Facebook! favorite?? that’s tough…. something chocolate perhaps…..? Lime sounds good to me! Oooooooooo, my cousin just made the lime ones and the flourless chocolate ones… the chocolate were my favorite! So many to choose from. I’m thinking pumpkin is my top pick. Or maybe a pumpkin chocolate swirl cupcake! 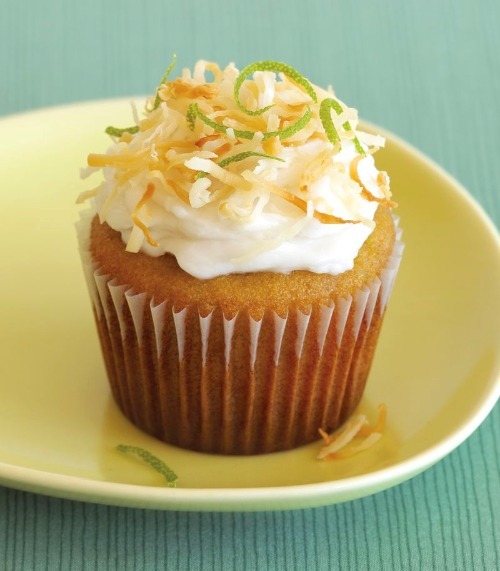 My favorite cupcake flavor is probably vanilla, but I can’t wait to try this coconut lime! I like vanilla cupcakes the most. I follow Elana on twitter and facebook! Love her. I love chocolate cupcakes with a fluffy white frosting! P.S. Oh, I know I’m late to the party (which is often the case with me), but I just wanted to comment on how much I love this cookbook of Elana’s. I had no intention of entering the contest and already follow and like (LOVE) all you lovely GF gals! Now I am following you! Excited to hear the winner! I like vanilla cupcakes, but I have to say, those lime ones look AMAZING! I ‘Like’ Elana’s Pantry on FB. And I ‘Like’ Cook It Allergy Free on FB, too! My favorite is vanilla cupcakes with chocolate frosting. Before I went gluten free my favorite cupcake was Boston cream pie.